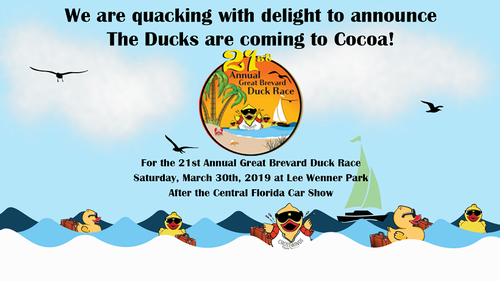 We are quacking with delight to announce the 21st Annual Great Brevard Duck Race being held at Lee Wenner Park in downtown Cocoa Village! The race will be on Saturday, March 30th beginning at 3:30pm after the Central Florida Car Show. The Great Brevard Duck Race is a fundraising event that benefits Crosswinds Youth Services. Ducks will be available for adoption for $5 donation at various bank locations across Brevard County or you can adopt online at www.greatbrevardduckrace.com. Every duck adopted gives hope to children in crisis and enters you for a chance to win fabulous prizes including the Grand Prize, a 2019 Honda Fit, free 2-yr lease, courtesy of Space Coast Honda.